Jamie Chung will be starring in a new Marvel tv show on FOX so it is no surprise that she attended their 2017 Upfront presentation on yesterday(May 15th) at Wollman Rink, Central Park in New York City. 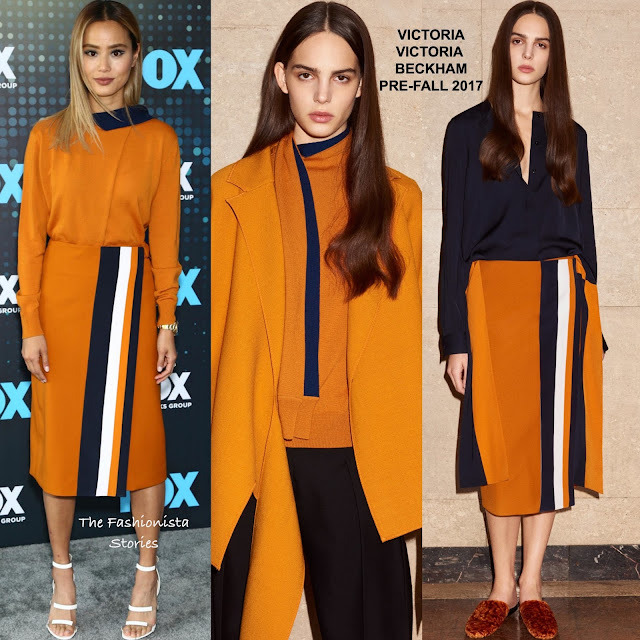 For the occasion, she wore a VICTORIA VICTORIA BECKHAM PRE-FALL 2017 ensemble which featured a maple & navy wrap neck sweater and the matching maple, navy & white stripe panel wrap skirt. This is a cute ensemble which was on tune for the occasion. Also I love this color combination which always works well together. TAMARA MELLON 'Frontline' white sandals finished up her look.